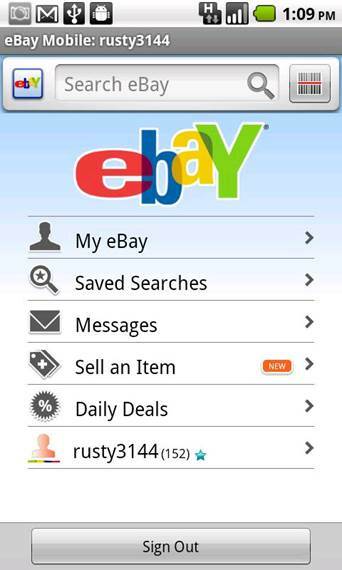 eBay is a buying and selling mecca and now it’s available on the go with the Official eBay Android app. The folk behind the app have made it as simple as possible to get online and keep on top of your auctions. There’s a search bar at the top where you can type in what you are looking for. If your search is too broad, you can refine it. Items pop up in a simple scroll screen, with the amount you have to bid in red and the postage and packaging and the number of bids underneath. You can view all of this without actually signing in. Once you are in, though, you can view all the items you are watching, the ones you are selling and the ones you are about to buy. The layout for the app is simple. From start-up, large button icons appear, which represent the channel choice available. 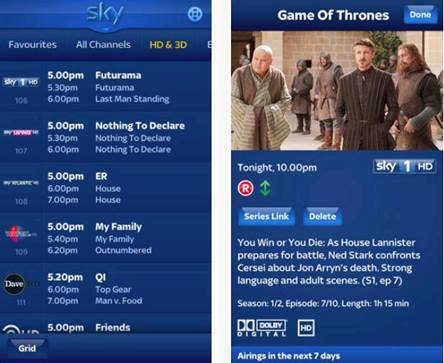 While you can dig through these straight away to find a show you want to watch online, you have to fiddle into the menu options to set up your Sky account. This takes a few minutes (go to ‘Info > Your Profile’) and essentially syncs your Sky+ box with your handset. Once done, you can remotely record programs with the touch of a button. It’s not all rosy, though. The niggles we have aren’t with the app itself but with Sky’s signing up process. If you are registered as a secondary user on the account (for some reason we were), it’s a bit of a pain to get on-board with the remote record option. But once you are done, you can record to your heart’s content. Unfortunately, you can’t do advanced things such as Series Link, though. While it’s unlikely you would want to do this because the app is meant for those rare-ish times when you forgot to set your set-top box to record, it would be nice to have the choice. While some may baulk at the idea of a social network for book lovers, Good Reads has made a decent job of taking the idea of an old-fashioned book club and pimping it out for the digital world. 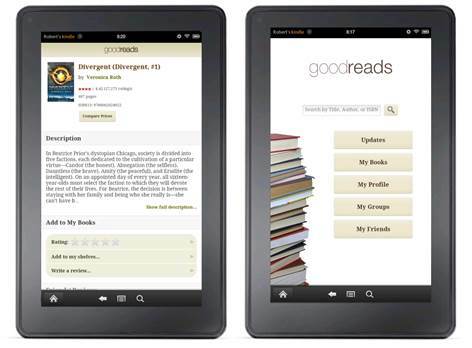 Although you can use the app to see what books have been recently read by those signed up to Good Reads, the app gets infinitely better when you register with the network and start supplying your own book information. One of the most useful parts is the Search functionality. Here you can type in an author or book name and user-­generated reviews instantly appear. As this is a social network, the reviews are much better than you would find on Amazon, because the majority of members are literate. In a world where some newspapers are asking for stacks of cash to view content, the Guardian is doing things differently on Google Play - it is not offering anything at all. Luckily, some plucky developer has found a way to deliver the Guardian through an app and also enable you to download the content to view when you are not in a Wi-Fi hotspot or when your 3G just won’t play ball. We have to stress that this is an unofficial app, but it was flagged up by the Guardian recently as one of the best apps on the market, so you can’t get much of a higher recommendation. To use the app best, you need to allow Guardian Anywhere to download the paper’s content to your phone. This enables you to view things offline and does take a few minutes, but once done the results are impressive. The app looks like the Guardian website and is broken into recent news, browse all stories and In Pictures. This is then broken into all the categories found on the Guardian website. The app is a revelation for those who have been browsing the full fat version of the site on their phone. Articles take seconds to load, images a little more. Everything is easy to read and the whole thing is a joy to use. Jamie Oliver is a funny pukka. Not only is he a youngish chef who seems to be best mates with anybody who was in a mid-’90s indie band, but he is currently trying to save the UK’s schools with his off-the-wall teaching methods. We think he should stick to what he is good at and that’s making tasty meals that can be prepared in minutes. Fortunately, he’s recently released the Jamie Oliver 20 Minute Meals app. 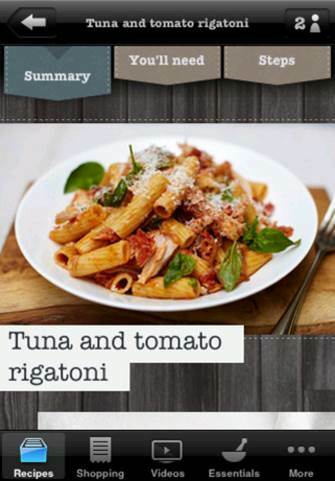 If you believe this app, you’ll be able to make the best rigatoni in the time it takes most people to get out of bed. But that’s a big if. To be honest, we are not a dab hand in the kitchen and have been known to burn a Pot Noodle or two. But Chef Oliver has made the app simple and fairly intuitive to use. Each recipe comes with step-by-step instructions and you can scroll through the recipes with one flick of the thumb. Every time we tried to get our meal made in 20 minutes, though, we failed miserably. Maybe our kitchen wasn’t properly in order and our knives not sharpened enough, but these meals just didn’t take 20 minutes to make. If you are happy to cook meals that take a little longer than 20 minutes, though, then Jamie and his on-screen videos will be of use - even if the $7.49 price tag is a touch steep. As guitarists are usually penniless souls, the thought of paying nearly $3 for an app that hopes to enhance your guitar playing may seem a little steep. Ultimate Guitar Tabs is one of the more polished apps you will see on Google Play, however, and is a definite boon to those who play the guitar. The sheer amount of content on offer is well worth the price. According to the app’s blurb, there are around 300,000 tabs for you to try out. Each one can be found by tapping its name into the app’s nice-and-simple search engine. If you like one of the tabs on offer, you can add this to your favorites. You can also view the chords on display and the app tells you if they are easy, medium or advanced. As there are so many tabs on offer, it is nice that there is a top 100 tabs section, which enables you to look at guitar tablature, bass, chords or drums. 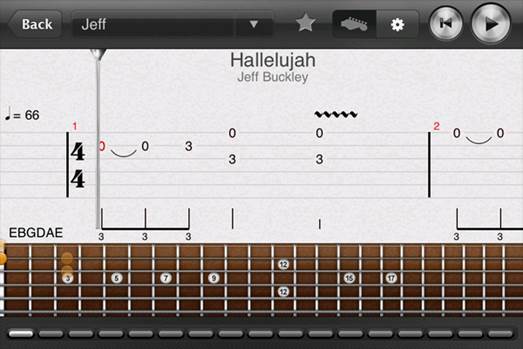 If you are a budding musician, Ultimate Guitar Tabs could well become your best Android friend.